Darn. We’re late again. I race along the walkway to the Rotary Centre for the Arts with my children. Somewhere inside the building a patient friend sits waiting for our coffee date. I’m about to run through the door when something catches my eye—a tree wearing a sweater. Yarnbombing is a type of modern graffiti that I’ve longed to witness for years. Also known as yarmstorming and guerrilla knitting, it’s when public spaces get “bombed” with blankets of knitting. The medium leaves the mark of the artist without damaging or ruining the space it’s on. I squeeze my little seven-year-old’s hand so tightly she has to use her leg to lever herself from my grip. My children have no expectations around my sanity when it comes to moments like this. They see me drooling over art and whisper things to each other like: “You’re looking after her when she’s 80.” I tell them whoever complains next will be on sponge bath duty as I pull them to the centre of the action. A table and tent are set up and reams of yarn are strewn about amongst weavers and knitters and stitchers of beauty. A sign says, Cool Arts, and I think: “Good point, G, be cool.” I slow my giddy dance to a saunter and try to mingle with the calm and peaceful crowd. The leader of the gang, Rena Warren, fills me in on their story. I walk over to a young woman wrapping a railing with an eight-foot cozy. I run my hands along a thousand little pink and white knits and purls. Cold steel becomes cuddle guard. I give it a small hug. “Did you make this?” I ask the woman. She says “Yes, me and my mom.” I pull out my camera and she lovingly poses in front of her art with a pride that makes me wish I had such rapport with my own. Then I meet Bob. He looks about mid-20s. He’s built strong and stands tough near the tent with a Clint Eastwood glint in his eye. I move in closer to see what he’s doing, hesitant to disturb him. He sees me coming and whips around, popping a huge smile. He lifts a colourful woven star made of sticks and yarn and gives a laid back nod at its awesomeness. I tell him I love it, he tells me he does too. Rena takes me over to a tree being adorned with multi-coloured wrap. Collectively it’s the most beautiful display of art I’ve seen all year. 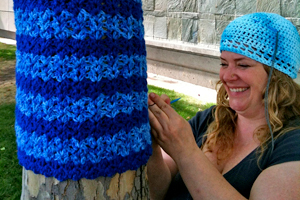 It’s easy to see why the practice of yarnbombing has a tight knit following (and brings out the puns in me). It’s yet another example of what’s wonderful about the Okanagan. On any given Sunday you can stumble upon really cool art being made by really cool artists from any one of the many amazing groups we have in town. It’s the kind of thing that can leave you so inspired you’re fit to be tied, to a tree. This multimedia writer has a passion for the arts. 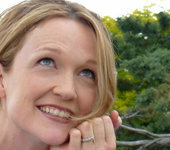 She's a radio host and producer, part-time weather girl and Okanagan Life's Culturista columnist.